Since April ended in Italy, you might guess that May began in April as we finished our sojourn in Florence. Florence was gorgeous and filled with laid-back fun. We planned to stop in Venice on our way to visit Earl's cousins in the Italian Alps. Why Venice? We had been there before with the kids, but one thing we didn't do haunted us. I told each of the kids they could spend 50 euros on something during that trip. Tucker wanted to go on a gondola ride. The cost was 86 euros and I told him no. I said it was a frivolous thing to spend money on as a kid, that he should wait until he comes back with a girlfriend and it would be romantic. Boy, did I regret that. Probably once a year, he would bring up the fact that I didn't let him go on a gondola ride. He was 10 at the time, so for a decade I had been paying for that decision. So we vowed to stop in Venice and get him a gondola ride. We didn't plan it well though because Venice was packed with throngs of people for the Mayday holiday. Walls of people walked toward us. We stopped and had a meal where they forgot to bring us our main course. We had our starters, they had been cleared and about a half hour passed, I went into the bathroom and noticed no one was cooking in the kitchen. Another waiter asked if we wanted our bill. "No, we want our food," we said in a hostilely polite way. After another 10 minutes or so, we decided just to pay for what we had eaten. The management was not happy. "We are not McDonalds," they said in what was an excellent insult toward Americans, but we weren't being impatient Americans. It was obvious they had forgotten about our main courses. So we walked on, our hunger partially abated. After wandering around shoulder to shoulder with humanity for a bit, the boys unanimously said, "Let's go." But what about the gondola ride? Tucker wanted nothing to do with it anymore. The lines for the water buses were long, so I consulted a nearby water taxi and the price wasn't that different. We hopped on. The man offered to show us various sights, but the boys were ready to leave Venice behind. So we drove north of Trento to Mezzana, Italy where Earl's 2nd (or 3rd or 4th) cousin, Cenzia greeted us and welcomed us to the Hotel Palace Ravelli. We spent three nights there as the hotel closed down for the season. We went on some nice hikes and visited with family. Aldo, the cousin on the right, is in his 80s and goes skiing everyday, but only for 3 or 4 hours, he explained. Finally, we headed back to France. We would spend a few days in Paris before the boys left. We spent the night in Chamonix. I loved it there. The town is so quaint and it wasn't too crowded because it was between seasons. We stayed in a small hotel right downtown and perused the menu chalkboards outside of restaurants before choosing one. It's one of my favorite memories of the boys' trip as we laughed and talked at dinner -- but maybe that's because I got a sinus infection right after that so didn't enjoy the rest as much. affordable and every place cozy against the May chill in the Alps. Next to Paris. I spiked a fever as we were driving and only wanted to curl up into bed when we got to the AirBnB. I sent my menfolk out to fend for themselves and they found a restaurant in a Medieval building that had house cats roaming freely. They enjoyed it so much we went again the next day when I was feeling better. We really just meandered around Paris, stopping at cafes and bars. We visited the rooftop of Galeries Lafayette for the first time so we could get some rooftop pictures. And then we had to say goodbye to the boys at the airport. We rented a car and drove to the Charente again for another housesit at the lockkeeper's house. This time, the weather cooperated a bit more. We stayed there for two weeks, enjoying walks with the dogs and visits to Cognac. I also got to meet another blogging friend -- Jacqueline, from the UK, at The French Village Diaries. We visited her little village Loubillé for VE Day. It was great to see how she had integrated into the community. She's even on the town council. We visited Oradour Sur Glane before heading south. It's a village that was massacred by the Germans during World War II. Every man, woman and child present and discovered was killed and then the town burned. The French have kept the town the same to help everyone remember the horrors of war. I wrote a blog post about it here. We stopped a few nights in Mirepoix, a walled city. We were biding our time until our rental house was ready and moving slowly farther south. Finally, we headed to our rental house in Quillan, our soon to be home. We had no clue how we might integrate into this community. But, within a month, we had numerous friends and acquaintances and it began to feel like home. Me walking home from the bakery with a baguette and our morning pastries. 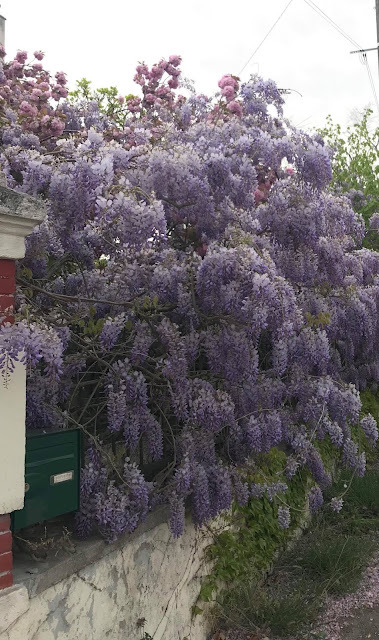 The end of May left us with a home to come back to, no matter where we traveled -- at least until December, but our first year in France wasn't even halfway through.